Did you know that Madrid was a relatively small town, practically unknown outside of Spain before the year 1561? The city’s fortunes changed that year when it burst upon the scene of European politics by becoming the permanent capital of Spain. The dynasty at the head of this change was known as the Habsburgs, a family that ruled the country and much of the known world from the 16th to the 18th century, and who were referred to in Spain as the House of Austria. 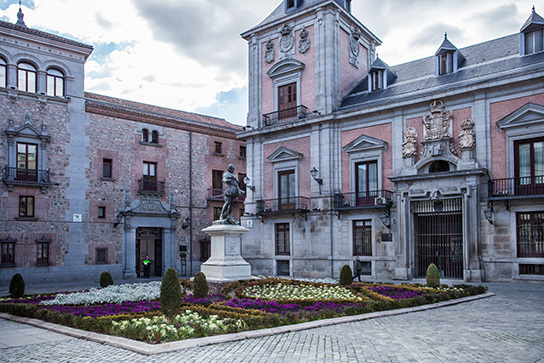 The historic center of Madrid was built up predominantly during the reign of that same dynasty, and this fascinating walking tour of Madrid de los Austrias, takes you through that area, giving you the best introduction to the Spanish capital. Over a period of two hours, your guide will not only walk you through and explain the history behind one of the oldest and prettiest parts of Madrid, they’ll also bring you up to date on the contemporary issues affecting the lives of everyday Madrileños. Topics covered include the role that religion plays in modern day Spanish society, particularly its schools; current opinion on the government’s handling of the economic crisis; the effect the housing bubble has had on Spanish society; how traditional covered markets in Madrid are having to transform themselves in order to survive; and how Spanish attitudes are changing towards institutions such as the monarchy. It is with the monarchy that our walking tour will start, as the royal palace occupies the very birthplace of modern Madrid. We’ll then work our way east little by little, visiting a square connected to the Spanish Inquisition, a mysterious “House of Malice,” a quiet back-alley cloistered convent, Madrid’s hippest covered market, the Plaza Mayor and much much more before ending at Madrid and Spain’s most well known square, La Puerta del Sol. Private Madrid walking tours, including half-day and full-day tours, are also available. Please contact for prices.